The Pollinator Symposium is Sunday, Oct. 28, in Concord. New England naturalists will be in New Hampshire this weekend to talk about new efforts to restore pollinating species and native plants. NHPR's Annie Ropeik has more about their first-ever pollinator symposium. Certain bees and other species that help plants reproduce have seen drastic decline in the Northeast and elsewhere in recent decades. It's partly due to the rise of single-species agriculture - where a single type of crop is grown over a large area. Courtney Allen is director of public programs for the New England Wild Flower Society. "Certainly we can talk about causes such as lack of genetically diverse and pesticide-free native plants - that's certainly one of the reasons for pollinator decline." But she says pollinators are important to maintaining biodiversity, and growing food crops. So groups like hers want gardeners to grow more native plants and help gather data on pollinators in the wild using citizen science mobile apps. They'll delve into those efforts at a new pollinator research symposium on Sunday, at the New Hampshire Audubon Center in Concord. Peterborough's community center is getting a bit of a makeover—with a honey bee mural. It's part of a local group's effort to raise awareness about the role bees play in our food systems. Each bee Matt Willey paints is about 3 feet long. By the time he's done, there'll be 200 on this wall. "It's amazing to me how many people I meet don't even know what a pollinator is,” he said. We may be hearing a lot about bees this week. It's national pollinator week - a chance to talk about the important role pollinators play in agriculture and the environment. And in New Hampshire, several organizations are planning events. As the populations of pollinators decline, national organizations like the Pollinator Partnership are working to raise awareness about the bats, bees, and butterflies that pollinate our crops. 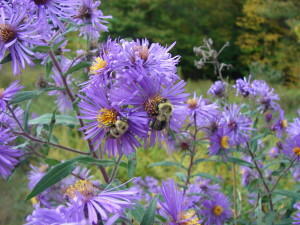 Monday, researchers from UNH released the first scientific findings about the state of New Hampshire’s bee population. It's the first comprehensive list of bee species in the state, including 17 species never before recorded in New Hampshire. The research comes after years of reports of declining bee populations around the country. Assistant professor of biology Sandra Rehan co-authored the report and said biologists will use this data as a baseline to measure future trends. Something Wild: How Are the Bees Doing? A Something Wild fan wrote in recently with a question or two. Ben, a backyard beekeeper in Deerfield, asks “I know there has been a lot of buzz about chemicals getting into the bee's main protein source, pollen. It would be really cool if you could mention the bees and what kind of plants the bees pollinate (and are exposed to) throughout the various seasons. Furthermore! Where in the world are the bees getting pollen in the winter? Sometimes I even see my bees bringing in pollen from who knows where on the rare warm day in the wintertime."